In ancient times, jewelry from precious coins served both as a talisman and as a monetary unit (there were from 1 to 40 pieces on the chain). They were used during long travels, because it was much safer to keep coins this way, especially during a sea voyage or a military expedition. Depending on the value of the metal, the products had a certain standard and a specific cost. Due to its practicality and convenience, this jewelry was common among the nobility, the military, and sailors. Precious coins have been used as jewelry since ancient times. Among the findings, there are large coins on the chain, which served as a prototype of awards and medals. The rulers gave them as a symbol of respect. Also, bracelets, chains, and large necklaces were popular. The large necklaces later received the name – monista. Do you know? You can rarely find a description of Victorian love tokens, coin jewelry. It is even less possible to see them. These items were made by lonely sailors who spent many months in the sea – far from their women and children. Before leaving for another voyage, they would take an antique coin, remove the embossing from one of the sides, and then engraved names, words of love and some symbols. These ornaments were worn on bracelets and pins for many years, awaiting family reunion. Wearing coin jewelry was common among many people. Most often, some precious items were found in the areas inhabited by Volga Bulgars, Tatars, Armenians and Greeks. 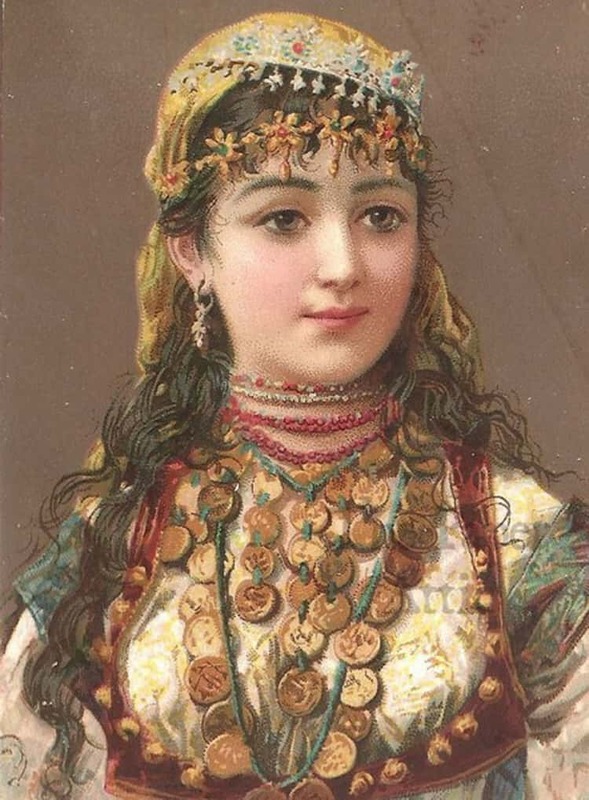 In modern times, ancient jewelry is typical in the national costumes of Asia and Europe, especially in Serbia, Macedonia, Bulgaria, and Romania. Also, monista has been a symbol of the Gypsies for many centuries. Ancient items, jewelry from gold coins, are stored in the museums. 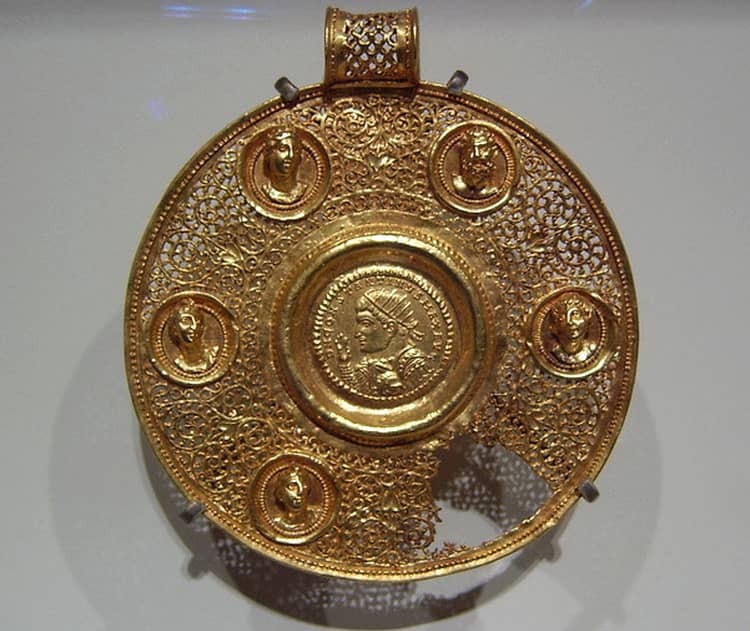 The oldest of them, a round pendant, was found in Byzantium. Some valuable exhibit can be seen in the Louvre. The center of the pendant is a double solidus, the obverse of which is flaunted with the beautifully made image of Constantine the Great and the reverse – his sons Crispus and Constantine II. The Roman currency was issued in 309 BC. In 324 BC coin spread throughout the Roman Empire, and later to Byzantium. Later, the solidus of Constantine the Great was used for a hexagonal pendant, bracelets, and stripes for clothes. Do you know? Ancient Greek coins were often filled with symbols, so they were used as talismans or amulets. For example, the gold coin of Alexander the Great – a monetary unit with the image of Hercules on the front side (the emperor claimed to be descendent of the mythological hero) and Zeus on the obverse (the most powerful Greek god sitting on the throne with an eagle in his outstretched hand and a scepter as a symbol of supreme power). Such coins were used in rituals, laid in graves and taken on the road. Another example is the golden pectoral (a jewelry that served as a part of military ammunition to protect the chest, throat, and shoulders) with precious coins and a medallion in the center. It was found in Central Egypt (near Lycopolis) and it is stored in the Metropolitan Museum in New York. The inscription is “Lord, help the wearer”. The medallion itself did not have any value. In ancient times, it served as part of the jewelry. The gold coins from it were authentic and represented different times. The most ancient item belongs to the years of the reign of Emperor Theodosius II, a little younger one – to the early years of the reign of Justinian I. In the jewelry, there are solidus, semis, and tremis (or their imitation). chain to wear on a chest. If there were not enough authentic coins, the imitations – bracteate–were used. It was jewelry made on thin sheets of precious metal. They depicted images of gods, emperors, animals, and Triskelion. 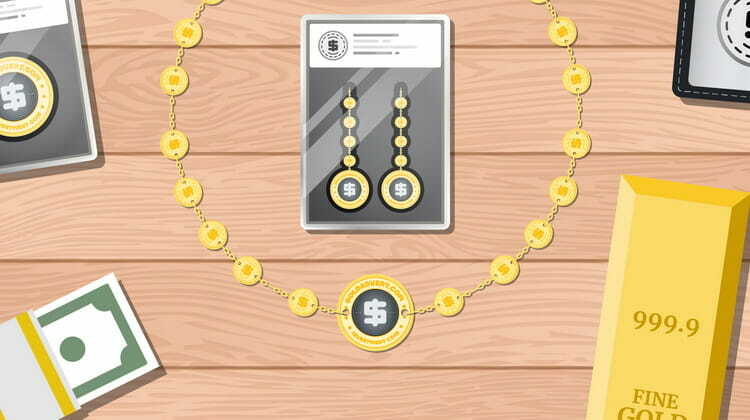 Monetary units from precious metals were not only chained but also used as clasps. A striking example – a gold necklace, found in 1893 near Anapa (stored in the Hermitage). The clasp has a solidus issued in 527 during the reign of Justin I and Justinian I. The weight of the coin is 4.47 g. Obverse – Justin I and Justinian I, DN IVSTIN ET IVSTINIAN PP AVG, CONOB, reverse – angel with a cross, VICTORIA AVGGG, CONOB (Constantinople). 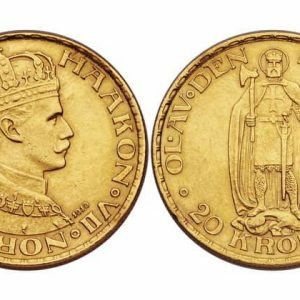 In 1902, legendary gold coin jewelry was found in Cyprus. 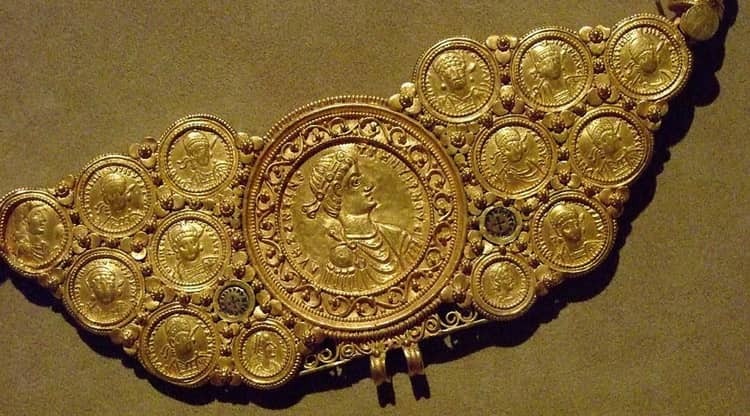 It was a belt from four large gold medallions of the emperor of Mauricius Tiberius. They were supposedly minted for courtiers in 583 (Mauricius’ entry into the position of the consul). On the obverse of the coin, the ruler is depicted in a consular garb and on the reverse – he rides the quadriga. Also, there were eight gold solidus issued during the reign of King Theodosius II and four gold solidus of Justin I and Justinian (similar to those found in the jewelry near Anapa in 1893) in that belt. 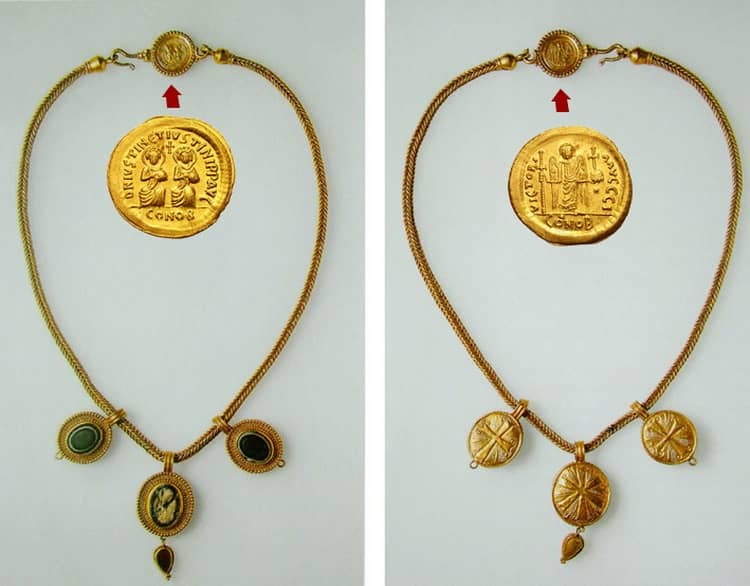 Necklace with gold coins (imitation of the Byzantine coinage) made by Anglo-Saxon masters of the 6th-7th centuries. In the world of numismatics, it is believed that the hole in antique coins is a defect that significantly reduces the collectible value. But recently in the US, a small business of creating jewelry from rare and precious items has been developed based on this feature. The basis for the jewelry is an antique solidus worth $ 450.They mount it, then put a lock on it and sell the jewelry item for 1,800 dollars. Do you know? In 1970, there was a growing demand for gold coin jewelry, which price was measured in carats. Pendants were made from Krugerrand, decorated with diamonds and rubies. Later, jewelry was made from the American Eagle gold coin. The bullion coin was set in a necklace. In the recent past, at a time when the price of gold reached its record maximum, many items were sold for scrap. Given this, as well as the intrinsic value and cost of the jeweler’s work, this jewelry has a high price. If you want to manufacture jewelry from coins, you will need a variety of items and special equipment. 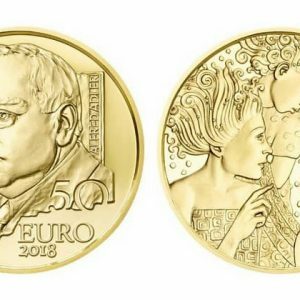 In the world’s catalogs of gold and silver coins, you can learn about interesting options, determine their value and choose a style of decoration. 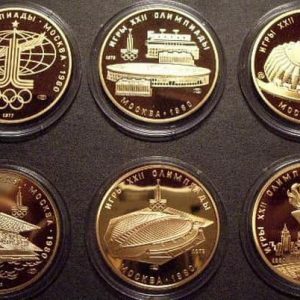 It is not necessary to buy expensive and rare coins. 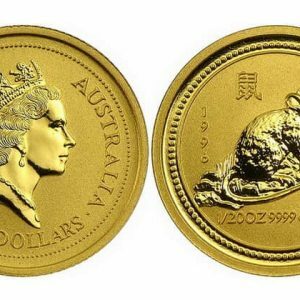 You can use coins issued in large numbers, coins with scuffs, roughness, poorly discernible inscriptions and images. You can make your coin look presentable by cleaning it at home.